Made out of sturdy nylon fabric with artificial leather details and embroidered logos, it is a thing of beauty to behold. Thanks to the unique front pocket, the bag does not tip forward as easily as other back packs, reducing the risk of having the bag tipping and spewing its contents on the ground. Another unique feature is the clever umbrella holder that enables you to carry the bag with the umbrella opened. This is perfect both for rain and very strong sunshine. It works wonders also when you have a caddie as he/she then has their hands free to wipe off discs. 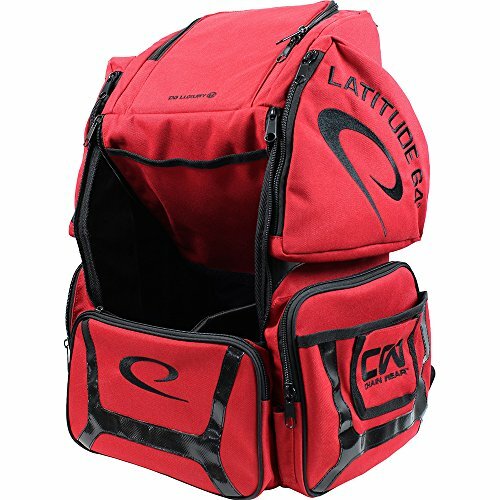 The bag is made to carry approximately 20 discs but can be made to carry over 30 if all compartments are used for discs.